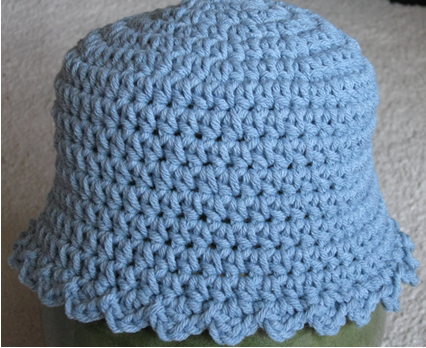 Crochet a cute baby blue hat. This free crochet pattern from Many Creative Gifts is a great one that can be made for a new addition to the family. It makes for a great gift at a baby shower. Find this great crochet baby pattern and many more in the 25 Quick and Thrifty Crochet Patterns eBook. GAUGE: 1 inch = about 4 sts and 3 rnds; finished hat measures about 17 1/2 inches in circumference. Rnd 1 (RS): Ch 3, 10 hdcs in 3rd ch from hook, join, do not turn. Rnd 2: Ch 2, [2 hdcs in next st, 1 hdc in next st] 5 times, join to top of 1st hdc (15sts). Rnd 3: Ch 2, 1 hdc in same st, [2 hdcs in next st, 1 hdc in next 2 sts] 5 times, join to top of 1st hdc (21 sts). Rnd 4: Ch 2, 2 hdcs in same st, 1 hdc in next st, [2 hdcs in next st, 1 hdc in next st] 9 times, 2 hdcs in last st, join to top of 1st hdc (32 sts). Rnd 5: Ch 2, 2 hdcs in same st, 1 hdc in next st, [2 hdcs in next st, 1 hdc in next 2 sts], 10 times, join to top of 1st hdc (44 sts). Rnd 6: Ch 2, [2 hdcs in next st, 1 hdc in next 3 sts] 11 times, join to top of 1st hdc (55 sts). Rnd 7: Ch 2, 1 hdc in next st and each st around, join to top of 1st hdc (55 sts). Rnds 8 and 9: Repeat rnd 7. Rnd 10: Ch 2, 1 hdc in next st and each st around, skip last st, join to top of 1st hdc (54 sts). Rnds 11 through 14: Repeat rnd 10. Rnd 1: [Ch 2, 1 dc and 1 sc in next st, sl st into next st] all the way around (27 "spikes" around), fasten off. Howdo you print patterns from Ipad? Oh that's a good question and I'm not totally sure! I believe you have to have a printer set up wirelessly. Then on the iPad, you should be able to print this page. I hope that helps! There is no button to print. Thanks. Hi there! If the webpage isn't showing a print button, you can use your settings in the Safari web browser to print. Here is a helpful article I found that offers great step by step instructions: http://www.solveyourtech.com/print-web-page-ipad/ I hope that helps! I have just started crocheting.....just a month now....and I was able to complete this in just a few hours. Great pattern....easy to follow. I have a grandson coming in April...this is just for him! I think,its a pattern I can understand . I'm just learning at the age of 80. On row 11-14 it says to repeat row 10. If you did that you would have 50 stitches at row 14 and then row 15 you couldn't do the last round and have 27 "spikes" I found that repeat row 7 will allow the pattern to have 54 stitches allowing the 27 "spikes" on row 15. With this pattern & patterns I've printed in the past the printing is so small you almost need a magnifying glass to read it. I know it isn't my printer as some patterns print okay. Is there any way the print could be made larger? I would like to make this hat to fit my girls that are 6 and 8 as well as myself. How would I enlarge this to fit the 3 of us? i would also like to know how to enlarge this pattern ? this is a nice and easy pattern...would be very cute with a little crocheted flower on the side, too. Thanks for sharing this free pattern! For those of you wondering about the beginning chain. It is only 3 chains long. When you hdc in the last chain the previous 2 chains become your first hdc. I think it should read make nine hdc in the last chain giving you a total of 10 hdcs. Hope this helps ,also think that they intended for the direction to read the circumference of the hat to be 17 1/2 inches not the diameter as was pointed out in a previous comment. For everyone asking how many chains to start: I don't even read crochet books, am a total beginner, but can still see it says, "Chain 3." That is the first chain. 3. It has to start out as the middle of the top of the hat. There isn't a long chain to start it. I too would like to know how long do you make the beginning chain. I am anxious to make the hat but without the length of the chain it would be hard to do. I to would like to know the lenght of the Chain. I made this hat in yellow with a white border and it looks like a little daffodil. I also used the border on a matching afghan--it was a little too ruffly so I changed it to "Ch 2, 1 dc in next st, sc in next st, sl st in next st" and it was perfect. Hi Mary Ann, I would like to know if you ever found out the length of the chain for the Baby Blue Hat? for vgirlsmom, maybe it is to make it a little tighter at and rim. I sure would like to answer to this also. I am confused when it asks to repeat round 10, won't the hat get smaller at the brim because you are skipping the last stitch on each round or is this just skipping the ch 2 at the beginning of the previous round? In round 1 what does (RS) stand for ? Made this little. Turned out really nice. Good for boy or girl. Thank you! This is a great little hat and so quick to make. I loove these types of hats on babies and small girls.